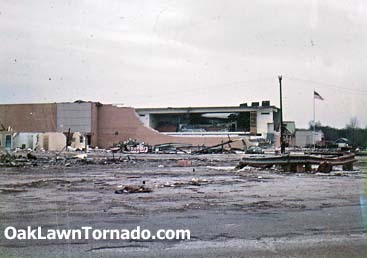 Below are a few photos from my personal colection in the few days after the twister struck. In addition, please go to this site. This is the Oak Lawn Public Library’s Flickr Photo Set of the Oak Lawn tornado. UPDATE: More photos of the twister were recently discovered, taken from the intersection of 87th Street and Cicero Avenue. 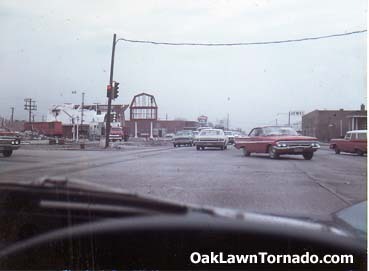 Intersection of Southwest Highway and 95th Street in Oak Lawn, in the few days after the town was struck by a deadly tornado. Sixteen people perished at this intersection waiting for the stop light to turn green.